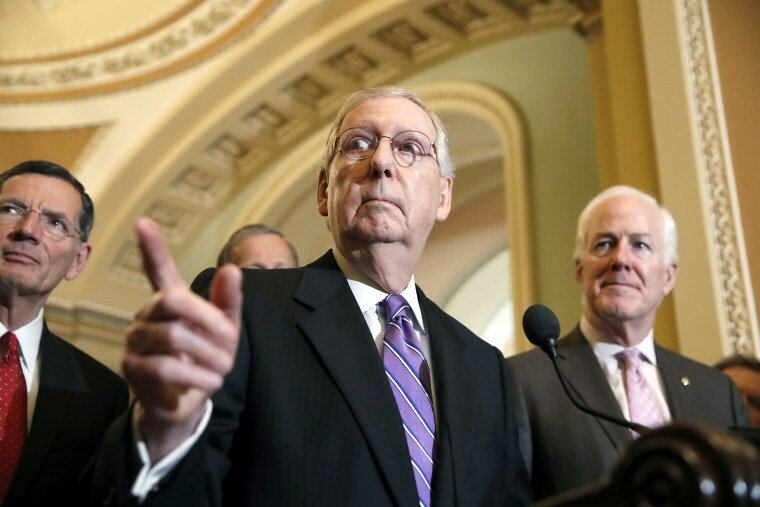 Mitch McConnell says the Senate is "absolutely" in play in the midterms. CA: Emily's List is responding to a new ad from Dave Min: "For Dave Min to falsely claim that we are ‘Washington insiders’ and ‘special interests,’ he is disparaging over five million EMILY’s List supporters, many of whom are Californian and live in the 45th District." FL: And Emily's List is endorsing Donna Shalala. FL-GOV: Phil Levine has a Twitter-blocking problem, POLITICO notes. GA-GOV: Another poll has Cagle and Abrams leading in their respective primaries. MD-GOV: After the death of her running mate, Valerie Ervin says she'll run for governor. MO-GOV: Reuters writes that Missouri lawmakers are convening today to being considering impeachment. Trump is targeting Planned Parenthood with a new abortion rule, writes NBC's Jonathan Allen. The president tweeted that DOJ put a "spy" in his campaign to "frame" him. Paul Manafort's former son-in-law will plead guilty of charges involving failed real estate deals. The probe of leaked Michael Cohen banking records is expanding after an explosive report in the New Yorker. Mike Pence is hitting the road with top Trump aides, writes Vaughn Hillyard. Trump is defending his comment about some immigrants being "animals," saying that he was referring to MS-13 gang members. Bill Gates had some uncomplimentary things to say about Trump in a tape obtained by NBC's Chris Hayes. Gina Haspel has been confirmed as the next CIA director. The White House and GOP leaders are reopening conversations about immigration, writes the Washington Post. And Sen. David Perdue, R-Ga., and Jenny Beth Martin pen an op-ed in the Washington Examiner recommending ways how to make Washington work again.